Hey all! Ready for another Sharon card?? I love this one and she has me wondering-why is my set not even mounted and ready to use??? Build a Blossom is in the Occasions Mini and has a coordinating punch. Don't miss owning them!! The card base here is Concord Crush-probably another reason I love this card. Purple :) The Framed Tulips Embossing Folder was used again on the background (it's actually a separate layer of Concord Crush on the base Concord Crush). Inset in the frame is a Whisper White layer that was textured with the Perfect Polka Dots Embossing Folder. 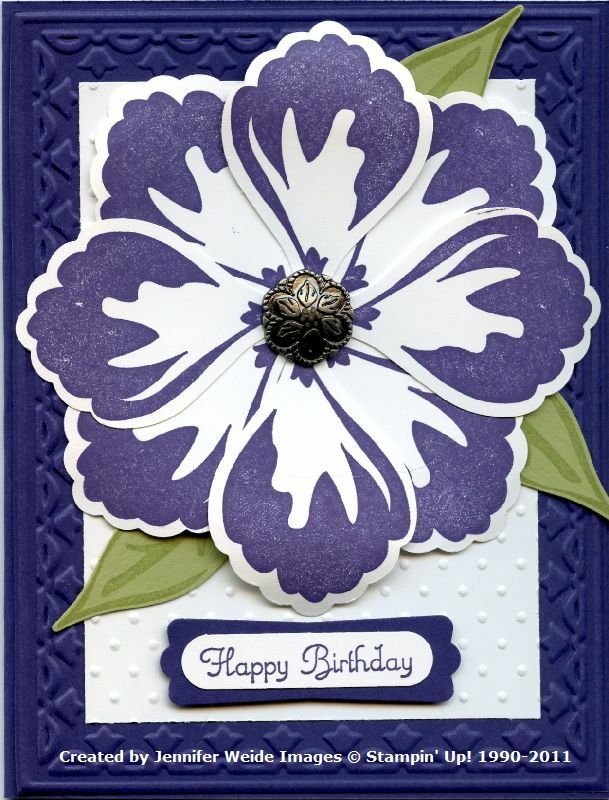 The petals were stamped on Whisper White in Concord Crush and punched with the coordinating punch. We used a small circle for the center to help with placement (3/4" I think). I did eight leaves, and layered 4 to the back and 4 to the front. In the center is an Antique Brad. 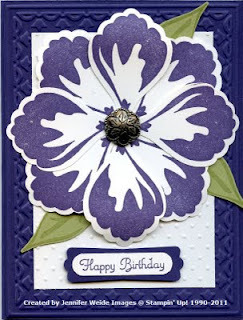 Before attaching the flower to the card, I cured the petals slightly over the Paper Piercer. The flower is then attached with dimensionals. 3 Petals of Pear Pizzazz were added under the flower. The Happy Birthday is from the Create a Cupcake set and is the perfect size for the Word Window Punch. That is layered on the Modern Label and attached with dimensionals. Beautiful!!! Thanks for stopping by! I hope you find some stamping time today! !